I’m not super sure what’s so valiant about being a marquis of Hell, but the Goetia describes Naberius that way. I’m also not sure what’s valiant about a black crane, but that’s what Naberius shows up as. He flies around the magic circle, speaking in a hoarse voice. He’s wise in the arts and sciences, but especially in rhetoric–the art of convincing other people of your point of view. And if you’ve lost your dignity or honor, he can help you restore it. 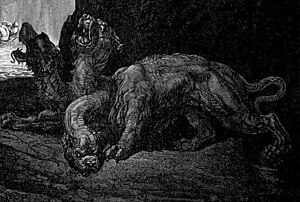 Naberius has been associated with the three-headed dog who guards the gates of Hell, Cerberus.